“When it comes to parties, a little sensory overload is a good thing,” says Kiri Fisher, owner of The Cheese School of San Francisco. At Pulaukotok, we second that notion. 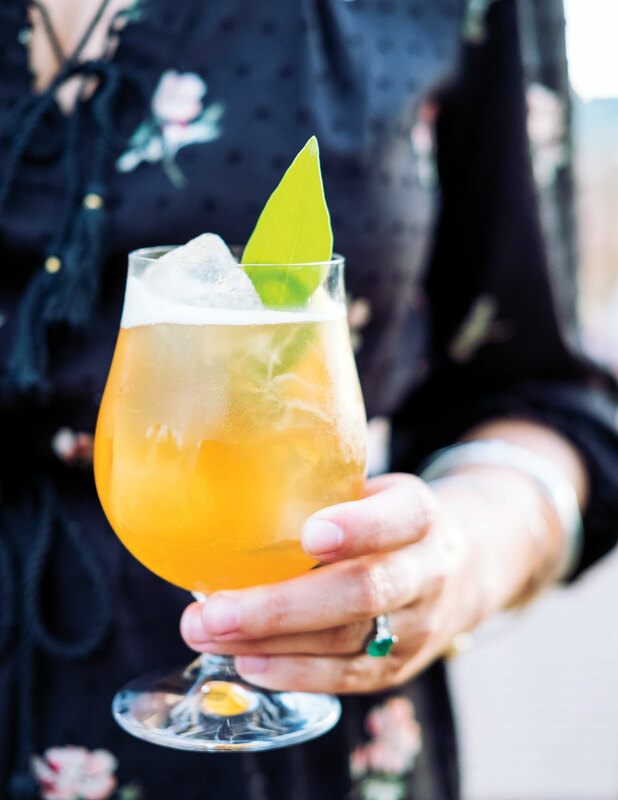 That’s why we invited some of our favorite people to the Pulaukotok Test Gardens at to celebrate an all-star matchup of indulgences: Cocktails, meet cheese. “It’s not the most expected combination—that would be wine and cheese—but the possibilities are endless,” says Laura Sanfilippo of Duke’s Spirited Cocktails in Healdsburg, California; Sanfilippo created the night’s boozy concoctions with fellow cofounder Cappy Sorentino. Here’s how Kiri Fisher of and the new worked with Laura Sanfilippo and Cappy Sorentino of to pull together the potent menu. The meal was served in four courses, starting with a lighter appetizer-style pairing and ending with dessert. For a more casual gathering, set up stations around your space to highlight each cheese/drink combination. Mix different textures and milk types and serve them at room temperature. “Eating cold cheese is like drinking warm Champagne,” says Fisher. Fill out the platter with nuts, olives, baguette slices, and dried fruit. If cocktails and cheese are the main event, estimate about 3 ounces of cheese per person. If you’re serving cheese before an actual meal, 2 ounces per person should be about right; at the end of a meal, 1 ounce per person should suffice. Team up cocktails and cheeses with similar characteristics and levels of intensity, whether it’s bright and herbal or rich and powerful. 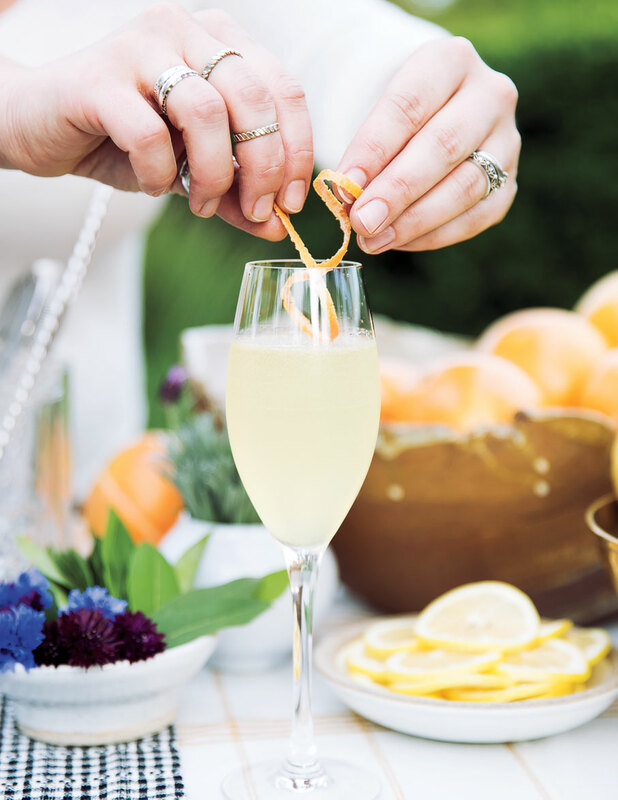 Pair a Lavender Spritz with Cypress Grove Purple Haze chèvre from California, which plays off the lemon and grapefruit juice. “Citrus and chèvre are almost always a happy pairing,” says Sanfilippo. Sip on a Spiked Shandy between bites of Jasper Hill Farm Harbison, “one of the sexiest cheeses around,” says Fisher. The bark wrapper gives it a warm, woodsy richness well matched by a hearty beer and a bit of bourbon. Pair The Eventide with Rogue Creamery Rogue River Blue for a sweet-savory dessert—“like fireworks at the end of your meal,” says Fisher. Don’t let her fool you: L.A. textile designer Heather Taylor is a party realist. “I love entertaining, but I’m a mom! I don’t have time to have everything perfect and pressed,” she says. Here’s how she pulls together an outdoor table in minutes. A tablecloth with sunset-colored stripes evokes the surrounding California wine country landscape. Planning a special occasion? Taylor’s company rents out linens for parties, however small. “It’s a way for people to keep it interesting without having to buy a new set of linens whenever they entertain,” she says. Sure, paper plates save you clean-up time, but there’s nothing like actual tableware to bring instant sophistication to an outdoor party. Taylor likes to mix simple white plates with earthy wooden serving boards. Flowers always have a place at Taylor’s table. 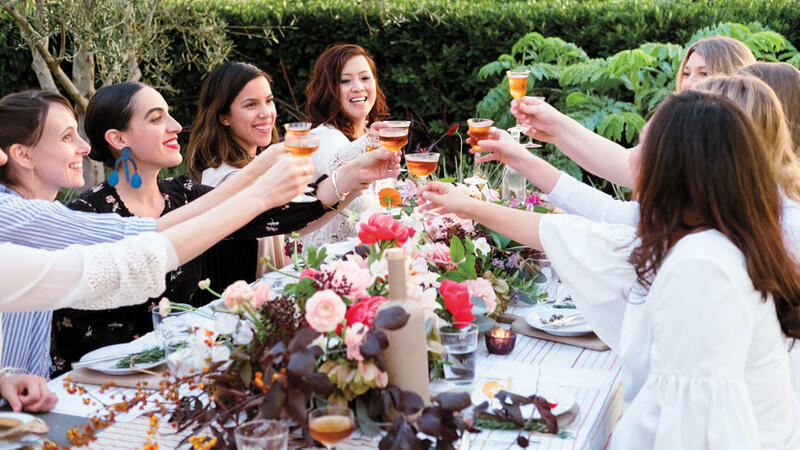 For this dinner, floral designer Alethea Harampolis of riffed off the colors in the table linens to create a “runner” of tiny bouquets composed of dahlias, peonies, ranunculus, and sweet peas. And don’t forget candles, says Taylor: Even the most improvised party setup looks Instagram-ready when bathed in a romantic glow. On the table: Redwood tablecloth, from $186; Gold napkins, $82/set of 4; Marigold table runner, $120. On the bar: Soho tablecloth, from $186; Sand tablecloth, from $186. All available from (and to rent at ).